One of our smallest espresso machines with commercial components. Now we offer a great bundle deal for this professional combination. With all new options this is as good as it gets for a great price ! 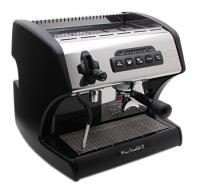 The Mini has the same great look as the Vivaldi II, performs equally well yet does not need to be plumbed in. Now with programmable + or - 8 degree offset differential and an added option to have a pre-infusion chamber installed on the group. Compak K3 Touch professional grinder in black. This is one of our best bundles ever. Water Tank Capacity (lt. / oz.) 3 Litres / 101.5 oz.